We use a spork to empty the catfood can into ourkittyboys’ bowls. We then mix the food with water–per vet instruction–to create a nice soup (for Del) and porridge (less water, for Finn). This method has helped Del lose weight (water fills him up; he eats less), and has improved Finn’s teeth—the water’s washed away the tarter build-up. Feeding the cats is 3x-a-day ritual. Sporks bring me joy. The bowl catches the good gravy, the tines stir the food & water to make soup/porridge. “Both terrapin forks & ice cream spoons were sporks in all but name (they were known as “runcible spoons” after the Edward Lear poem“—a poem my grandmother would recite to my delight when I was a kid, and possibly why I like poetry now. Fast food restaurants & institutions love ’em: 2 plastic utensils for the price of one. 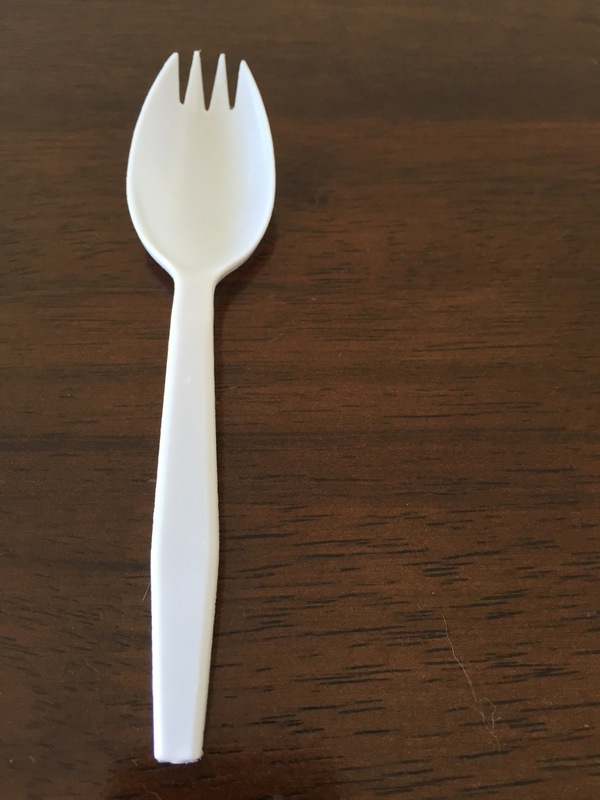 Prison sporks are orange & even more woefully weak, so they can’t be used as a weapon. We have two metal ones taken from Lufthansa. They are fantastic, but I feel terrible having stolen them.